The Bako National Park is one of the oldest national park in Kuching and Sarawak. It covers the northern tip of the Muara Tebas peninsula, an area of 27 sq km. Despite its small size, Bako National Park contains a wide range of vegetation and is said to offer visitors a glimpse of almost every type of vegetation found in Borneo. 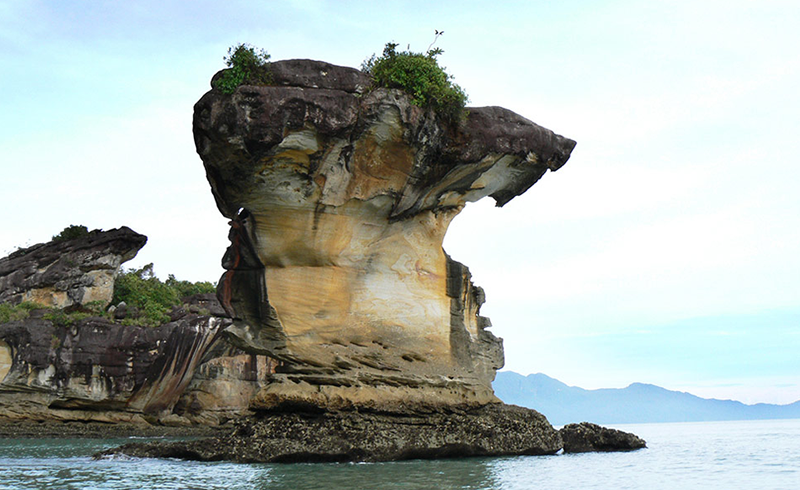 Bako National Park is famous for guaranteeing it’s visitors rare view of wildlife and amazing rock formations. The park has a coastline covered with small bays, coves and beaches, making it a perfect place to go trekking, aside from relaxing. At the Bako National Park, you can see a wide range of vegetation – swamp forest, scrub-like field vegetation, mangrove forest, dipterocarp forest, delicate cliff vegitation and more. Bako National Park is said to contains almost every type of vegetation found in Borneo. It is also said that the national park contains a rich variety of wildlife. Due to its abundant flora and fauna, Bako National Park serves best as a place to enjoy nature. Among my favourite activities here are bird watching, and checking out the wild life which roam free. 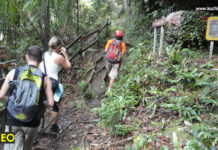 Another great activity in Bako National Park is trekking with routes starting from 500 meters, up to 5.75 kilometers. There’s also some fantastic nature’s work of art within the area with the Bako sea stack which is a popular choice for postcards originating from Sarawak. To be frank with you, facilities at the national park are rather basic, despite efforts to improve them in the past. As I know, the facilities available are listed below. There are no ATMS on the park as well and the only way out of the park is by boat. Bookings for the facilities above can only be made via a travel agent or directly through the Sarawak Forestry/Sarawak Government, which manages the park. Due to the park limitations, and the limited number of accommodation, I do encourage booking hotels and accommodations nearby the Bako National Park as an option. 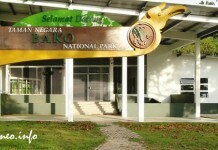 HOW TO GO TO THE BAKO NATIONAL PARK? If you have your own transportation, driving up to the Bako Market (where the National Park jetty is located) is highly recommended. The route can be seen below. However, if you do not have your own transportation, taking a ride sharing service like Grab can be an option. Else, public transportation would be the way to go. A bus from Kuching to Bako Market takes about 45-60 minutes. The bus is red and is numbered as 1. It originates from the Kuching Open Air market, and also pick up passengers from the bus stand opposite Riverside Majestic Hotel in the middle of Kuching. The ride cos RM3.50 each way, and bus service begins at 7AM until 6PM. The last bus out of Bako is at 6PM. Another alternative is to use minivans which can be chartered for around RM30 for some 5-7 people. The journey time is shorter than using public buses and the minivans usually depart when they have enough passengers. Such service is available nearby the Kuching Open Air market. Minivan services are usually over by 5PM. When you arrive at the Bako Market head on to the jetty/visitor center to register and purchase an entrance ticket and to buy a boat ticket. The entrance fee to the Bako National Park is RM10, but the boat ride charges can differ. You can inquire the rates by contacting the Bako Boat Service Counter at +601125132711. The counter opens daily from 9AM to 3PM. Upon settling entrance fees and also boat ride services, the 20-minute boat ride comes next. The ride arrives at the Bako National Park Headquarters. The ride itself is exciting and there’s a lot to see during the ride. It is important to note that boat return arrangements is highly recommended. You could also contact Mr Shadad who runs the Bako Boat Service at +60109493860. The Bako National Park is one of Kuching and Sarawak’s most prized attractions. The national park may be a bit far from the city, but the abundance of flora and fauna is unmatched. If you are seeking something similar which closer to the city, a visit to the Semenggoh Nature Reserve and Matang Wildlife Centre is recommended. Been to Bako National Park? Do let me know what you think! The journey to Bako was memorable. 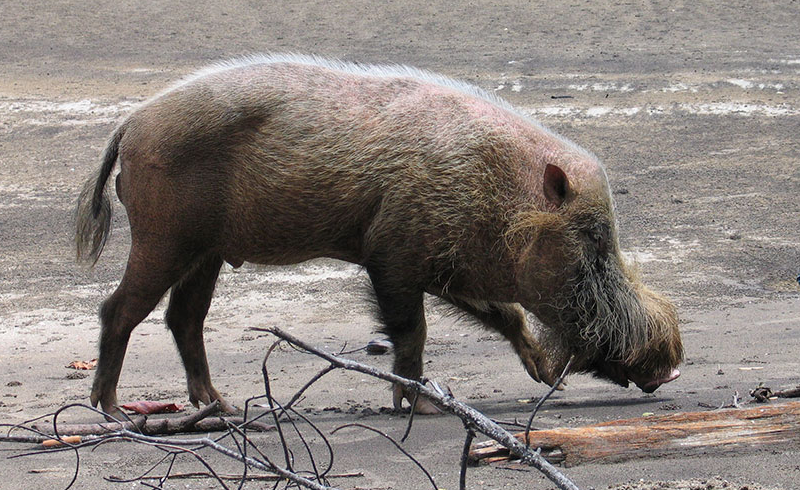 Stayed there a night and saw real live wildboars. Be ware of the monkeys!